We recommend this tour for those, who wants to see South Moravia , meet vintners who‘ll let you peek into their secrets and find out a lot of interesting things abourt this place. 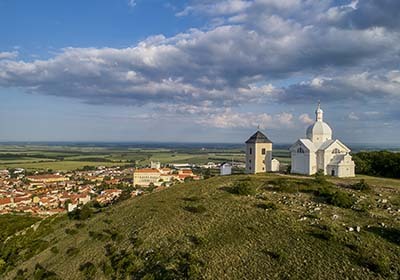 For people in Southern Moravia, wine isn‘t just a job, it‘s a hobby as well as their lifelong passion. The vineyards’ lines are inscribed on the protracted slopes of this landscape. Its story begins in the spring in the awakening vineyards, reaches its climax in the summer sun and its ﬁnal form is achieved in the fall, the time of harvesting, fermenting and ripening. Come to Moravia and set out in the twilight down a vintners’ lane with ancient winepresses and cellars. 1st day: Departure from Prague. Lednice - Valtice complex. Accommodation in hotel " Zamek Cejkovice". Wine degustation. This day, you will visit the romantic chateau Lednice, which is situated in the extensive natural area on the embankment of the Dyje River. Originally a Gothic fortified settlement was located there, mentioned as early as 1222, which Prince Přemysl donated to the Lichtenstein family. Lednice was their residential place till the end of World War II with only one short break. In the 16th century, the settlement was rebuilt into a Renaissance chateau. In the late 17th century, the Viennese architect J.B.Fischer rebuilt it in the Baroque style. The Valtice Chateau is situated at the place of the castle of the Passau bishop from the late 12th century. In 1395, the Lichtenstein family also bought this place, rebuilt the castle several times and in the 16th century the castle was rebuilt in the style of Mannerism. During the Thirty Years' War, the Swedish military forces damaged the chateau several times; the damaged objects were later completely rebuilt into the recent Baroque residence. The reconstruction lasted up to 1730 and several renowned artists of that time, such as J.B.Fischer of Erlach, A. Ern and J.K.Ern, D.Martinelli and others, participated. After accommodation in hotel, we offer you a wine testing. Overnight in hotel. 2nd day: Breakfast. Departure to Mikulov. City Tour. Wine degustation. Lunch. Excursion to Jaromerice nad Rokytnou. 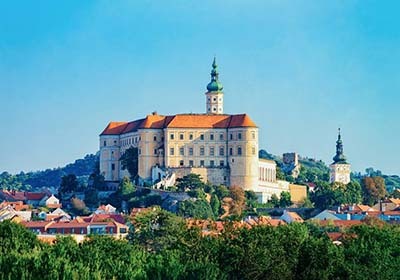 Mikulov is situated in the very heart of a wine region, that is why it also offers vine paths with stops in local public or family wine cellars or wine tasting centres. When talking about wine festivals in the Mikulov region everybody will in the first place remember the traditional Pálava vine harvest and wine festival, held over the second weekend in September in all lanes and corners of the town.The Baroque castle of Jaroměřice nad Rokytnou ranks among the most impressive examples of 18th century architecture in the Czech Republic and Europe.The castle is furnished with period furniture, thus preserving the atmosphere of an 18th century residence. The precious collections housed by the castle include antique musical instruments, valuable paintings, porcelain, clocks, furniture etc. Once in Jaroměřice you can also visit the Church of St. Margaret, at the same time as the castle joined to the castle building itself. Overnight in hotel. 3rd day: Breakfast. Excursion to Castle Pernstejn. Pernštejn Castle is a castle located on a rock above the village of Nedvědice and the rivers of Svratka and Nedvědička, some 40 km northwest of Brno, Czech Republic.It was founded by the Lords of Medlov before 1285. The family branch seated at the castle adopted the then fashionable name Pernštejn, which is the Czech version of the German name, Bärenstein - "the Bear Rock". Its history is closly connected to the Lords of Pernštejn (Pernštejnové) and their descendants. 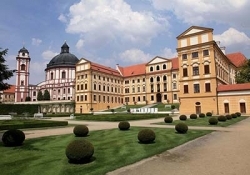 The castle is one of the most preserved castles in Czech Republic. Overnight in hotel. 4th day: Breakfast. Departute to Prague. On the way to Prague, we will stop in Castle Slavkov u Brna and will visit famous places of Battle of Austerlitz. Transfer to Prague.